I have said it before, on this blog and in scholarly publications (also here), but I will say it again: It is no exaggeration to say that sociologists are only interested in guns and gun culture to the extent that they are related to crime, violence, and social inequality. Now, to be fair, sociologists are only interested in many things insofar as they are related to some social problem. In fact, we teach courses called “Social Problems” not “Social Benefits.” One sociologist even took to Twitter recently to crowdsource an answer to a student who asked for a recommended book in sociology that had a positive outcome. 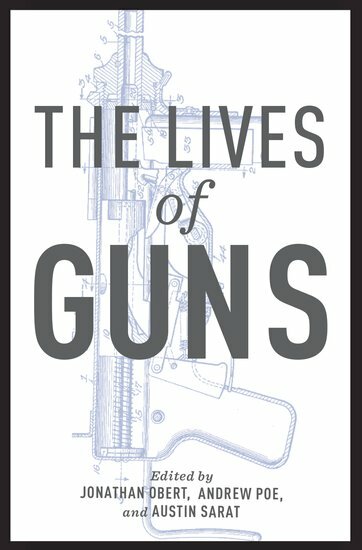 So it should come as no surprise that a recently published book on The Lives of Guns takes gun violence as its starting and ending point. But this book comes with a little bit of sugar for those who are interested in the lives of guns beyond violence and social inequality. It is sometimes said that edited volumes are where ideas go to die, so please do what you can to help my chapter avoid this fate! Within the ideological framework established, other contributions are well-done and I will assign the book in my Sociology of Guns seminar this spring. Joanna Bourke’s history of the dum-dum bullet (Chapter 5) – a perspective that is criticized by Matthew Ford in his book on military weapons that I read recently. Harel Shapira’s “How to Use the Bathroom with a Gun and Other Techniques of the Armed Body” (Chapter 8) – title says it all. Tags: Amherst College, Crime, Jonathan Obert, social inequality, sociology, Sociology of Guns, violence. Bookmark the permalink. Thank you very much for your email and post, as always, and especially for providing your chapter and for the heads up regarding the book! It’s very generous of you and will be interesting to read. Written for an academic audience, fair warning. But feedback, if any, welcome! Reblogged this on Windage and Elucidation. 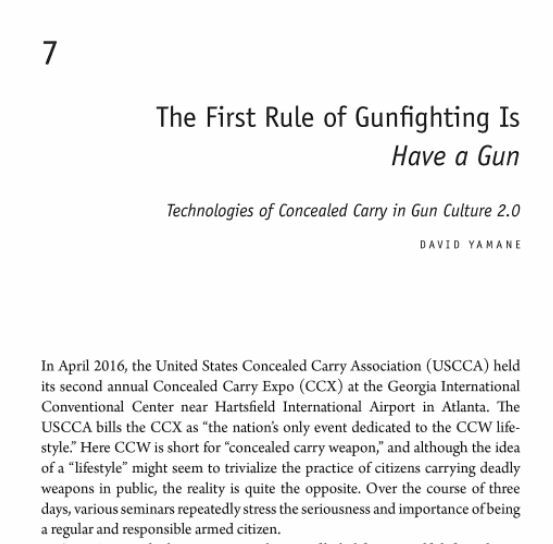 Need another chapter called “The Social Currency of Guns”. To wit, I’ve rarely met another gun person who was not instantly charmed into a half hour conversation as soon as I asked him or her something about their firearms. On the Friday after Thanksgiving I went up to the Los Alamos range to sight in a rifle I purchased a couple months ago. I had a spare scope in the work room and decided to mount it on the newly purchased AR to try my hand at 200 and 300 yd steel target. The weapon worked flawlessly and I didn’t need all the sight-in targets I put downrange so offered them to another gentleman who was arriving as I was putting the caps back on my scope adjustments. He gladly took me up on my offer of “free paper downrange”. As he started to set up, I asked what he was shooting and he said an M-1 Garand and an M1-A1. I guess I looked impressed. He asked “have you ever shot an M1? Everyone needs to shoot an M1”. When I was in NROTC we shot M-16s and I got to shoot an M-60 and a 1911 but never an M-1. Well, now I have had the pleasure of shooting an M1 and watching that little steel band that holds the 8 rounds in place fly by my nose as it was ejected. Quite the nice day. Plus, the AR dinged the steel targets every time…of course I was shooting 75 grain BTHP match ammo, so I guess it should have. I’ve seen plenty of people get grouchy in public, but for some reason, never at the range or the local gun shop. Social Currency. I like that. It’s OK to call that little steel band a ‘clip’ if you want to, since it is an en bloc clip. Glad you got to spend some time with the Garland – here in NC, the NC Rifle and Pistol Association used to sponsor an annual Garland clinic at Camp Butner where attendees learned to shoot a Garland in High Power competition. Purpose was to fulfill the CMP requirements for getting an M1 from them. Was a lot of fun – gun and ammo and instruction was provided for a reasonable fee. I don’t think they do these clinics any longer. Does your spell check have something against John Garand, or just in the holiday spirit!? Cheers! En bloc clip. Now I know that terminology!